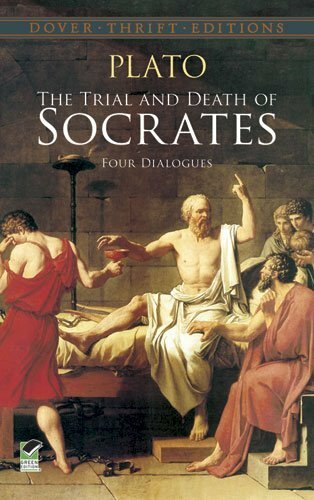 Plato: The Trial and Death of Socrates, Four Dialogues, edited by Shane Weller. Socrates (469 BC - 399 BC), like any noted philosopher, had his protégés. Chief among them was Plato. In fact, without Plato’s writings chronicling his mentor’s ideas and approach, Socrates’ contributions would not have survived. To this day, his famous Socratic method is an invaluable technique for understanding the essentials of any intellectual or moral dilemma. Socrates is famous for the line ‘The unexamined life is not worth living.’ He stressed the value of reasoning through the important things in life to determine truth. 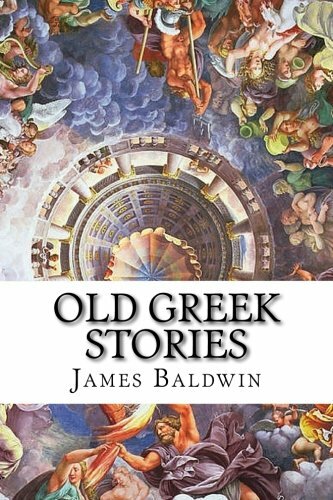 As the title implies, the book focuses on Socrates’ ideas (four dialogues), which went against the authority of the state of Athens. This led to his imprisonment and his death. His devotion to logic shouldn’t deflect from his humanity. His love for reason, beauty, and justice was astonishing. I wept when he drank the deadly hemlock and paced his cell before his legs gave out. 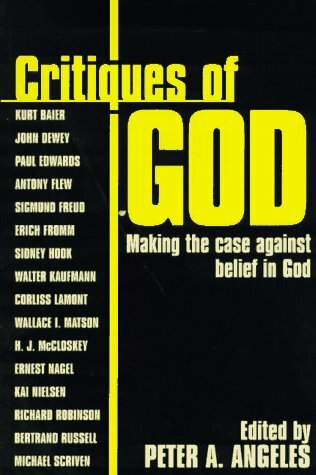 Critiques Of God; making the case against belief in God, edited by Peter Angeles. This is a book of essays from some of the more renowned skeptics of the 20th century. Bertrand Russel, Erich Fromm, John Dewey, Michael Scriven, and many other noted men of letters offer objections to faith in the God of western religions (Christianity, Islam, Judaism) – objections that range from thought provoking to moronic. For example, one point against the famous design argument is that since the universe is full of color, the theist, in addition to concluding that there is a Grand Designer, must also conclude that there exists a Grand Colorer, and because this title strikes the essayist as silly, the entire design argument should be jettisoned. This type of objection to faith reminds me of an argument I ran across recently by an atheist who rhetorically asked, “If we humans are so important to God, why did it take Him 16 billion years after the Big Bang to finally get around to creating us?” One might be inclined to answer that question with another one. “Would God’s existence be more palatable if He’d created mankind only three billion years after the Big Bang instead?” These kinds of objections strike me as insincere. Regardless whether you’re seriously seeking answers, already truly believe, or have genuine reservations about faith, you deserve better questions than the dismissive rhetoric found in much of the new atheist’s repertoire. I was an atheist for over a decade. The irony being that during those years of skepticism regarding all things religious, I, like every contemporary atheist I’ve since met and debated, believed all sorts of things I had little or no evidence to support. I embraced innumerable assumptions that failed to withstand the scrutiny of either a cross examination in a court of law or the rigorous demands of a clinical study. Yet when it came to extending that same courtesy to religion, I assumed the stance of the Pyrrhonist, questioning everything but my own name and filing for a dismissal on the grounds of insufficient evidence before the case could even come to trial. This is the inherent contradiction all atheists suffer, or at least those I’ve known, read from, or debated, namely the belief that only the scientific method can prove anything, as if only those things demonstrable in either a lab or a court of law are meritorious. This begs the question: what standard does one use to determine that the scientific method is the only viable method for determining truth? Is there an independent scientific method to determine that? And why does the skeptic assume that science’s silence regarding the supernatural somehow negates the supernatural? This is like saying the production of cotton and silk disproves the existence of sheep since wool isn’t required for the manufacturing of those materials. Besides, this implies that before the invention of the scientific method, nothing could be known or stated with any certitude. So much for experience and reason. 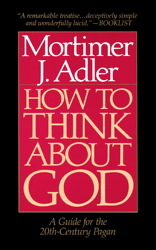 How To Think About God, a guide for the 20th century pagan, by Mortimer J. Adler. Written in terms as simple as the field of philosophy allows, Adler foregoes mysticism, faith, and science, throws out all the cosmological arguments of his predecessors such as Aristotle, Anselm, and Aquinas and uses nothing but strict rationalism to prove the existence of God beyond a reasonable doubt. More intriguing still is that Adler, throughout most of his career (including the years he wrote and published this book), was a non-believer.